Shanty Creek Resorts’ Up North Michigan hospitality is legendary. Our three distinct villages within 4,500 acres of pristine landscapes are surrounded by golf courses, ski mountains and spectacular views of Lake Bellaire. Enjoy our complimentary shuttle service to experience the whole resort, and to nearby downtown Bellaire. Boasting a $10 million renovation, The Lakeview Hotel & Conference Center at Summit Village offers million-dollar views of Lake Bellaire, miles of pristine hardwood forests and out-the-door access to The Legend and Summit Golf Courses and Summit Mountain’s slopes. With spacious and lavish guest rooms, The Lakeview Restaurant & Lounge, Arnie’s Grill, The Spa at Shanty Creek Resorts and over 16,000 square feet of meeting space including the renovated Grand Ballroom, Bellaire Ballroom and Fireside Parlor, Summit Village is the heart of Shanty Creek Resorts. Featuring 72 suites and studios plus 14 condominiums, this elegant village showcases well-appointed accommodations in one- and two-bedroom suites and three- and four-bedroom condos with views of Cedar River Golf Course or the north face of Schuss Mountain. Guests staying at Cedar River are treated to the convenience of out-the-door access to Cedar River Golf Course, the downhill slopes of Schuss Mountain and 30 km of Nordic trails. Ideal for corporate events, Cedar River Village includes over 7,100 sq ft of meeting space, creating a perfect harmony of high-tech facilities and natural vistas from every window. European Charm Up North – Located at the foot of Schuss Mountain, Schuss Village exudes European charm. Featuring a variety of accommodations from villas and condos bordering the Schuss Mountain Golf Course to guest suites with views of the Schuss Mountain ski slopes and walking distance to Ivan’s for Apres-ski entertainment and fun. Once you get a taste of Northwoods Michigan high country golf, you’ll want more. 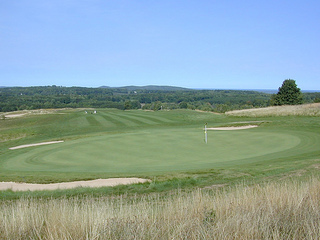 Shanty Creek boasts 72 holes on four unique and distinct championship golf courses, each combining challenging play with Up North natural beauty. When it comes to golf, the bar has been raised. Sporting tight fairways, formidable doglegs, breathtaking hazards, and varying elevations, Shanty Creek’s golf courses put golfers in an enviable position—trying to read and play those challenging greens amid the stunning views. wraps, massages, herbal therapies, and unique combination therapies. Family Fun Found – From season to season, Shanty Creek keeps family fun on the menu. From winter wonderland sleigh rides and dog-sledding to summertime outdoor movies under the stars, GPS driven geo-caching explorations, and much more, there’s always something to do. Throughout the year, we’ll publish our seasonal activities so you and your family can decide what to do during your next getaway. Michigan’s Favorite Slopes – It’s no surprise Shanty Creek was rated “Best Downhill Terrain in the Midwest” by OnTheSnow.com’s visitors. With 49 runs on two mountains, more than 200″ of snow annually, and a 450′ vertical drop to suit any snow lover—novices, intermediates and experts—Shanty Creek is a snowsports paradise where terrain meets tradition. And with competitive rates, special event pricing, and season passes available for all ages, Shanty Creek makes it easy to schuss all winter long.